We’ll be running online gauntlets of Kill Sector on Roll20. If you’re craving some gladiatorial action, but haven’t been able to get people together, come to us and we’ll set up a session! More details can be found here. Pop the cyber-champagne! We have liftoff! Kill Sector can now be purchased on DrivethruRPG in pdf format for $10USD. You are now fully able to live in our world - the world of action figures and big guns and sick fights and weirdo warriors. We hope you enjoy playing the game as thoroughly as we’ve enjoyed making and testing it. Create to your heart’s content - crazy characters, enemies, gauntlets, settings, and beyond. Right. Due to a misunderstanding of DrivethruRPG's digital publishing timeline, the official release of Kill Sector has been briefly delayed. At this moment, we are unsure exactly when the document will come out, but it should (should) be within the next few days. We will keep you posted. Kill Sector Releasing Dec 16! After about a year of working on our passion project, we here at Bahunga Worldwide are proud to announce that the PDF of our tabletop game, Kill Sector, is due to release December 16th! We’ve been working our tails off revising the game, rebalancing functions, and making sure everything is pitch-perfect. I can say with confidence that this is exactly the game we envisioned from the get-go, and so much more. What we have shown you on our website is barely scratching the surface of what we have in store - at last count, we have over 700 functions in our point-buy system, as well as the means to modify them to suit your needs. We are extremely excited to show you the universe of gladiatorial possibilities we have made for you. The game will be released exclusively on DrivethruRPG, where it can be purchased for $10 USD. As a quick update - we've been making a whole lot of progress in the past couple months - more than even we expected! I won't spoil too much, but I will let you know that we've been jam-packing the core rulebook with hundreds of functions to apply to your character, and plenty of open space for modifying these functions. We've also been sharpening the rules and making it as easy as possible for new players to enjoy the game. Speaking of which, if you happen to be in the Southcoast Massachusetts area, we're setting up playtest sessions in several local venues. We tend to playtest on Thursdays and Sundays, but we have a modicum of flexibility when it comes to that schedule. I'm actually typing this as we are setting up at The Armoury in Fairhaven. We've also playtested at Table Top Games in Westport in the past, and are looking to branch out in the Southcoast and Providence areas. If you're interested in playing Kill Sector with its creators before it's released to the general public, and/or if you operate a venue looking to run a rules-lite, casual roleplay system that your customers can jump in and play without knowing anything about roleplay games, feel free to contact us at killsectorgame@gmail.com! In three days from posting this, public access to the beta version of Kill Sector will be closed out indefinitely. Specifically, it will close out on the 31st, at about 4:00 PM EST. From that point on, the beta will only be open to journalists. Journalists will be able to access the beta through the same form, but they will have to provide a link to the website they would plan to post on. We will refer to this as a "private beta". If you've been on the fence up until now, this would be the time to sign up for the beta while it's still open to the public. 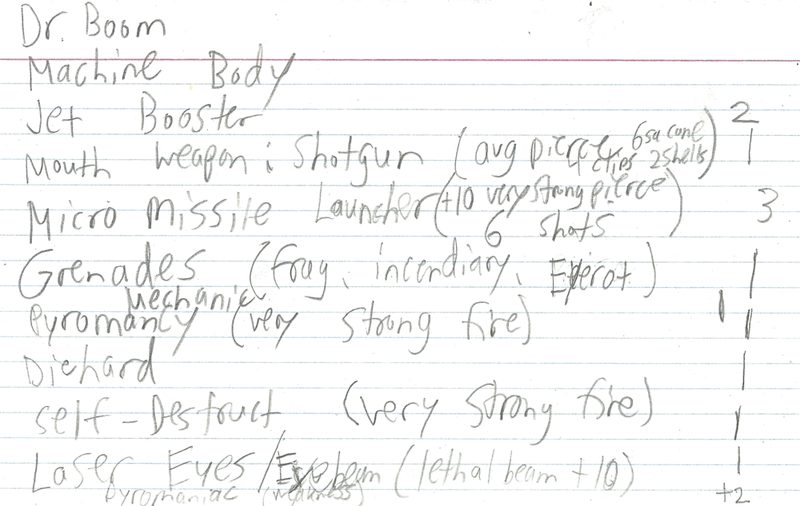 In the process of playtesting Kill Sector, we've collected a fair share of character sheets from our playtesters. I figured it would be fun to show off some of the different kinds of characters you can make with our point-buy system, as well as show a bit of what we do behind-the-scenes and talk about some of our own playtesting anecdotes. Some context: players are given 10 points to make a character. They spend these points on functions, which cost different amounts, scaling with their usefulness. They can also gain points back by taking weaknesses, which hinder them in one way or another. There isn't any one standardized way for people to organize their character sheets - different characters operate under completely different means, so they prioritize different bits of information. As long as the GM gets a rundown of how many points they spent on what, and the player has enough information written that they won't put the game on hold to check what their functions do, anything is fair game. Starting off simple, Thunder Dome is a skeletal warrior blessed by several Roman gods. His main form of attack is to call down lightning bolts from Jupiter, which reflect off his helmet and into his enemies, scorching himself slightly in the process. Of course, this plan only works for so long, as he didn't pack another weapon, and the undead can't be healed by most means. Sparse is a rollerskating clay golem with really long arms and a double-ended jackhammer - specifically, two normal jackhammers duct taped handle-to-handle. His backstory is as charming as his art: "In an abandoned construction site, some kids got together and built a dirt man. Then they found a magic construction hat and when they put it on him he came to life." Lagarthah is a poisonous, plantlike alien that can regenerate from death, but is (ironically) deadly allergic to water. Her main weapon is a giant fan - as in, an oversized industrial fan with a handle on the back for aiming. Cyclone Jack is a tough cyborg alien with the power of space voodoo. One arm ends in a swordlike appendage, the other splits into two long and flexible gun barrels. He can endure three attacks that would otherwise kill him, instead leaving him at 1 HP each time. Whenever someone hits him, he can choose someone to take part of the damage along with him, due to his connection with voodoo. However, Cyclone Jack's tactics are limited, as he's too trigger-happy to formulate a strategy, and he knows next to nothing of the universe outside his homeworld. 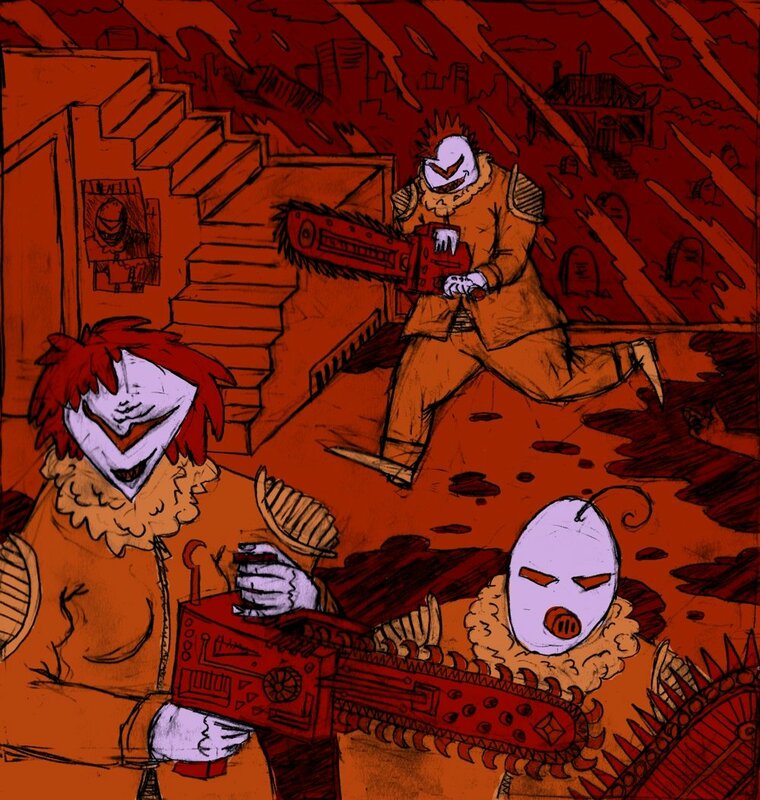 Geniba is an alligator-man from the swamplands, wielding a chainsaw that can slice someone from ten feet away. His fairy companion, Pivvie, is a trained medic, who patches up Geniba as he fights. Geniba is a tough warrior, but he's bad at realizing when something is being hidden from him, and relies on Pivvie to spot stealthy foes. Gauss Hoss is a sentient helicopter that constantly produces slime for reasons he'd rather not talk about. In lieu of a machinegun, his weapon compartment houses a magical staff that hurls fireballs. His main strategy is to scoop up his allies with ranged weapons and rain hellfire on his enemies down below. This is actually one of my own characters, and one of my favorites to play. Dr. Boom is a pyromaniacal robot filled to the brim with weapons, including a self-destruct module and a shotgun stored inside his mouth. He is constantly obsessed with making the biggest explosion possible, and if someone does something theatrically destructive, he is compelled to one-up them with his own pyrotechnics. The Arcana is a stone golem able to summon deadly and hyper-accurate pillars of flame. He can also give people curses that, when activated, cause tiny explosions all over their body and the bodies of anyone nearby. However, he is constantly under physical pressure by the volatile magical forces that animate him, and a hit in the right spot will cause him to violently explode. Over the course of the gauntlet, the player updated the art when he put on the boss's trademark shades. 02563 is a bioengineered human with potent psychic capabilities. She can manipulate her surroundings through telekinesis, and can override people's will with mind control or even leave her own body to possess theirs. Despite being blindfolded, she can sense the world around her through sonar. One of her legs is replaced with a katana from the knee down. She is subservient to her master, who has bound her arms and left her mute and blind. Similar to The Arcana, her art was updated during a gauntlet when she befriended a bat, which used to be someone's hand. Last but certainly not least, Patruchi Giddub is a giant caterpillar and ex-cop, with two of his front legs ending in biologically-produced shotguns. He wields two revolvers and a BLASTER from his days in the force. He's a quick shot, and can feasibly use most of his weapons all at the same time, but he's weak to poison, he can't keep track of the chaos of the arena, he's got an itchy trigger finger, and one swift bop from a baseball bat might be enough to spill his bug guts. Some day, I'd love to see some art of this guy. These are all only a small fraction of the characters people have played during our playtesting phase, and we're not even close to finished. Sign up for the closed beta, and send us scans of your character sheets, and we could feature them in a future character sheet showcase!